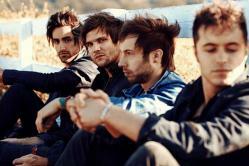 Boys Like Girls is an American rock band from Boston, Massachusetts. Formed in 2005, the group gained mainstream recognition when it released its self-titled debut album. Boys Like Girls was the co-headliner withGood Charlotte for the Soundtrack of Your Summer Tour 2008 that toured across the United States. The group's second studio album Love Drunk, was released on September 8, 2009. As of February 2011 the band announced they would be going on an indefinite hiatus. On November 17, 2011, Martin Johnson revealed that the group had not broken up; rather the members were taking a rest and engaging in various side projects. In 2012, Boys Like Girls announced that they were working on a new full-length studio album, titled Crazy World, which was released December 11, 2012.